Depoe Bay is the site of the world’s smallest navigable harbor. Waves run beneath lava beds creating spouting geysers up to 60 feet into the air. Sea caves line Depoe Bay's scenic rocky shoreline. 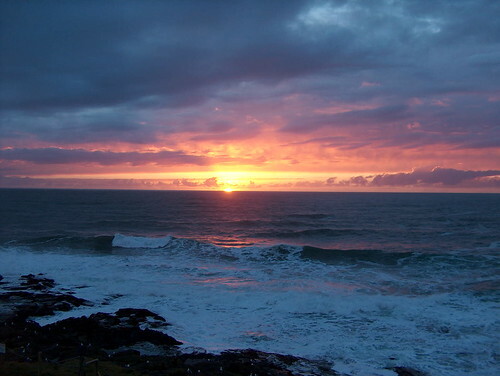 Depoe Bay is teaming with marine life and rich in natural resources. The stunning beauty of Depoe Bay’s rugged rocky coastline, snug harbor and easy access via Highway 101 make it one of the most popular destinations along the Central Oregon Coastline. A huge sea wall runs the length of the downtown area allowing visitors to shop or dine always within view of the ocean. We have the distinction of being the only town on the entire coast with this amenity. Our fairy tale fishing village is brimming with colorful stores, gift shops and galleries featuring maritime collectibles, fine art, apparel and the tastiest candies and salt water taffy available. Watch whales frolic and feed in our bay, explore tide pools and feel the power of the surf. At day’s end, follow the path of the setting sun as it sinks into the Pacific in a blaze of glory. Visitors from everywhere come to whale watch in Depoe Bay. You can spot whales either from many shore observation spots or to take a charter out for a closer look. There is nothing quite so spectacular as seeing whales in their natural habitat. Whale watching trips aboard comfortable cruisers or speedy Zodiacs depart hourly for eye-popping, up-close tours of Depoe Bay’s exotic marine life. The Depoe Bay Whale Center is home of the highly acclaimed “Whale Watching Spoken Here” program. The center is dedicated to sharing information about whales and helping visitors to understand and appreciate these amazing creatures. For Depoe Bay events, festivals and happenings check out the Oregon Coast Calendar. On Memorial Day, each year since 1945, Depoe Bay has hosted the FLEET OF FLOWERS. This colorful ceremony is recognized as one of the most impressive observances held in the United States. The event was initiated to honor the memories of two fishermen, Roy Bower and John Chambers, who died at sea in an attempt to aid another fisherman. One of the joys of living on the Oregon Coast is spotting whales, especially during the state’s two official Whale Watch weeks in spring and fall. More whales have been sighted along the coast in a few days this spring than during an entire week last year, says interpretive ranger Ian Fawley at the Depoe Bay Whale Watch Center. Spring Whale Watch week last year logged 1,082 whales. Depoe Bay is a jewel on the Oregon Coast. The tiny town is packed onto a hillside next to the world's smallest working harbor. The main street is highway 101 past a densely packed couple of blocks of candy, ice cream, and tourist shops across from the seawall where waves can crash over the highway in heavy weather. But, on a calm and sunny day, you just can't drive right through town - you simply MUST stop and walk around, even if your destination is elsewhere. Depoe Bay is also a great place to watch for migrating Grey Whales that often veer into the bay for shelter or a rest. And, although rarer, occasionally Orcas may also be seen. This Years Hunt is all NEW! So find your crew and Join the fun! We spent four nights at a WorldMark Trendwest (aka Whale Pointe Resort) condominium in Depoe Bay, Oregon on our Oregon Coast trip last month. This was a gift from one of Pat's daughters and her husband for our third wedding anniversary. Here are a few photos from the Depoe Bay area. DEPOE BAY, Oregon – Jon Hamlin learned a few things about Hollywood movie making during the filming of "The Burning Plain" at his coastal restaurant Tidal Raves. First, he was delighted that its star, Charlize Theron, really liked his cheesecake. Second, he discovered how serious movie making can be. And, third, he's "sure glad" to have taken the plunge and turned his restaurant into a film set." I knew it would be difficult, but I soon realized that making a movie takes the same long hours as operating a restaurant," said Hamlin during a recent interview at his Tidal Raves Restaurant. ... Depoe Bay and Tidal Raves have long been a favorite coastal getaway for visitors from nearby Eugene, Salem and Portland. Depoe Bay is said to be the “World’s Smallest Harbor.” Also called “The Hole in the Wall,” it is one of nature's most unusual and beautiful seaside places. The Pacific Ocean butts up against the steep landfall but there is a little hole in the rocks giving access to the tiny harbor. Sharks have existed in our waters since the age of the Dinosaurs. They live in every ocean on Earth, including the waters of the Oregon Coast. Sharks have remained virtually the same for 350 million years and is the largest and one of the most feared fish in the sea. Sharks are also essential to the equilibrium of the marine biotope. Of the over 450 species of sharks, only 15 or so can be found in Oregon waters and yes, the Great White Shark is one of them. On Monday a 12-foot shark brought into Depoe Bay by some recreational fishermen has been confirmed as a great white. The anglers told the State Police Fish and Wildlife Division officer at the dock that the shark had become entangled in their crab gear and was brought to the surface when they pulled in the pots. It is unclear if the great white was alive or dead when it reached the surface. Under both federal and state laws, taking or possessing a great white shark is illegal. And the shark was confiscated by the officer and released to the Hatfield Marine Science Center at Oregon State University, where Department of Fish and Wildlife biologists identified it as being a great white. There are always a few Great White’s off the Oregon Coast but they are usually not close to the beach. Our Oregon Coast ocean is usually a bit too cold for them in the summer months. (FYI Oregon Ocean temperatures are actually warmer in the winter) This year our Oregon Coast ocean temperatures are warmer than normal and it is not surprising that this would bring Great White Sharks a closer to shore.